When originally asked to write a short story for sffworld's anthology The End - Visions of Apocalypse, I penned a little time-travel short with a Twilight Zone ending. It was called Greener Grass. It didn't "quite" fit the theme of the anthology, although it did plant the seeds for my novel Hollow World. So, I needed a new short story for N.E. White's project. It was summer, and I had just learned of Ray Bradbury's death. My wife and I were taking a bike ride down to Washington DC, and for part of it, we would be passing through Alexandria Virginia. Thinking about Fahrenheit 451, my favorite work of Ray's, got me thinking about book burning. It was impossible to ignore the irony of being in a city named after the most famed library burning in history. Hence, the idea of the story for N.E. 's anthology came to mind. Recently, some groups on goodreads chose to read Fahrenheit 451, and I offered them my little short story for free. Then, I made it available to those in "The Dark Room" (a private/secret) goodreads group. Then I figured, why not keep going...and so now I'm making it available through this blog. Just click on the cover or this link. I'll send you a copy in whatever format you wish. I hope you enjoy it. Okay, so I'm not going to kill you, but I do love seeing how my name translates into various languages. 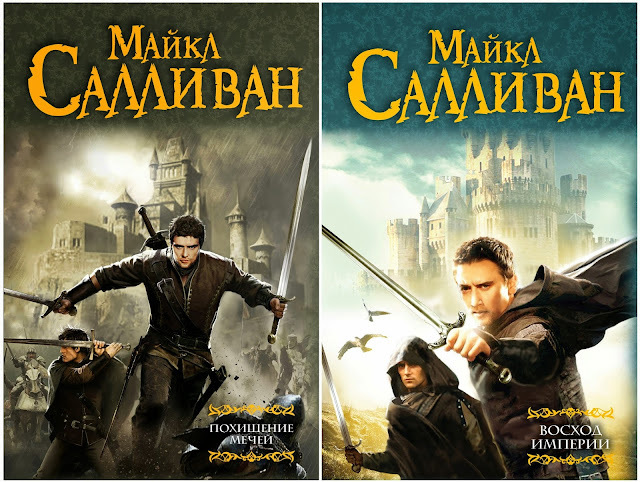 I learned today that the second Riyria book has just been released in Russia and that's what got me to know that Майкл Дж. 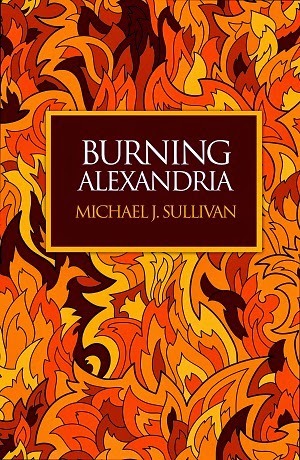 Салливан is Michael J. Sullivan in that language. 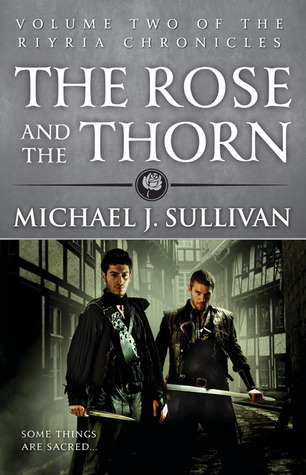 Here are the covers for the first two books. For some time now, I've been saying I'm going to try to get the third Riyria Chronicle out by the end of the year, so no new news there. But something has changed recently, and it's worth doing an update. As people may know, I've finished writing my new series, The First Empire, which has been picked up by Del Rey and will be coming out in the summer of 2016. When arranging this deal, I'd been working under the assumption that I had up to April or May of 2016 to get the third chronicle book done and on the market. Turns out it's gotten a little more complicated. You see, Del Rey is going to put a big marketing push into the new series, and so they don't want any Riyria book hitting the streets in 2016. What this means is rather than "trying" to get the book out by the end of the year, it HAS to hit the streets before December 31st or it turns into a pumpkin. Okay, so it won't actually become a pumpkin, but it will have to sit in line behind the release of the initial three books of The First Empire, and that would mean a long wait. Because time is so short, I won't be able to release this book through Orbit or any other traditional publisher. The ONLY way to meet the deadline is to self-publish. Going that route isn't a concern. We've done it before and can do it again. But it will mean a lot of hard work on both mine and Robin's part. With The First Empire now finished and behind me, I can concentrate 100% on this next Royce and Hadrian tale. I've already been developing ideas, but now I have to take all those bits and pieces and weave it into a cohesive story. Having done this a few times my confidence level is high. Still, until it's written and through alpha testing (Robin's read), I'm never entirely sure if I'll have a winner or a dud. Speaking of testing, I'm going to be needing some beta readers for the release, but time will be short. Robin figures there will be only three weeks for people to read and provide feedback. If you are interested in being a beta reader, then here is a form where you can sign up. The beta will probably be hitting somewhere around September, so for college folks take that into consideration when signing up. Another thing that will be keeping Robin busy is a Kickstarter for this book. We are working with a partner that should be able to get the books into bookstores and libraries, but to do so we'll have to do a print run of at least 5,000 hardcovers, plus cover costs for warehousing and distribution. All told, we anticipate the production of the book will cost about $33,000. We're going to finance the $4,400 for cover design and editing and also throw in another $2,600 for printing, but that means we'll still need to raise $26,000 for the printing. Given that the Hollow World Kickstarter funded at $30,000+ I think this should be doable. The good news is if we don't hit the goal, the book still comes out. The only difference is there won't be a hardcover edition, and it won't be sold in stores. We want to reward avid fans, and so we'll have some "early bird" specials for the Kickstarter, but you'll have to be quick to grab them. For instance, a number of early backers will get their rewards at a discount, and there will be bonus content for those who sign up in the first two days. If you want to be put on a list for notification, here's a link. Here's also a preview of what we'll be giving away and the price points for each. (Click on the chart to see a larger version). Notice the (D)Early Bird, (P)EarlyBird), and (H)Early bird are the digital only, paperback + digital, and hardcover + digital rewards but at a savings of 20%. Also, we're going to have three different versions of the hardcover. We're also going to be having a number of "add-ons" such as posters, t-shirts, and coffee mugs. So you'll be able to get some other cool perks if you are in on the fun. One last thing that the Kickstarter is going to be able to provide is a helping hand for authors that could use a little boost in getting people to read their work. I'm going to open a contest and publish someone's short story along with my book in the hope that they can get some additional readers. I (and/or Robin) will evaluate each query, and ask for full submissions from worthy candidates. Everyone will get a critique of their query even if not selected. From that candidate pool, we'll pick a winner and help them by providing structural editing/coaching and copy editing to turn the story into a finely polished piece. We'll be paying them twice the "pro-rate" for short stories (because the "pro-rate" is ridiculously low). So, they'll get $0.15 a word rather than the $0.07 that most paying fantasy magazines and anthologies provide. Even those that don't get selected will get query letter feedback, which I would have loved to have "back in the day." Hopefully, the person that get selected will receive a little more exposure for their work. So, that's a lot of news, and hopefully a lot of people will be excited about this. The Kickstarter will provide the best means for pre-ordering the book, and those people will get it before it's available through the retail chain. If I don't make the December 31st deadline, the Kickstarter backers will be "grandfathered in." They can still receive their books in 2016 because they were purchased in 2015, but everyone else will have to wait until after the third First Empire is released. Hopefully, that won't be an issue, but doing the Kickstarter allows me to hedge my bets and make sure that at least some people will get the book earlier rather than later. I hope you are as excited about all this as I am. We'll keep you updated as the project moves along. One of the great things about the "business of writing" is there is always another mountain to climb, always another goal to reach for. For some, this realization would be crushing. For me, it's invigorating. The other day when Robin an I were about to set out for lunch she asked me to wait a few minutes because she was waiting for something and she wanted to capture it when trigger. I wasn't sure what she was talking about but after another five minutes or so, she said we were "good to go." When we got back from lunch, she sent me this image and told me to post about it. I'm sure there is some explanation why people like watching numbers turn over to all round numbers. I remember watching my first car (a beat-up Dodge Dart that was more Bondo than metal), switch over from 99,999 to all zeros. I actually pulled over to savor the moment. 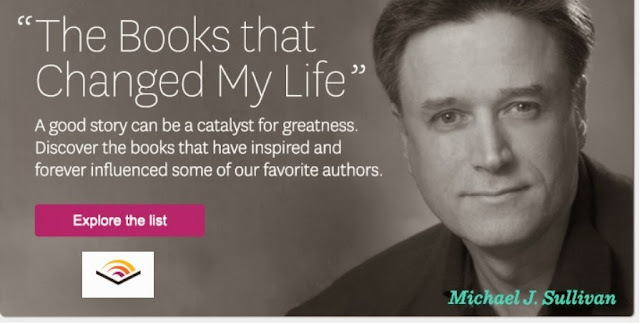 So I understand why Robin was excited to see 200,000 books added to people's shelves in goodreads. I'm just not sure why anyone but us cares...but she wanted me to post and given our recent bullet dodging, I'm inclined to do as she asks. I will say this. I never, believed such a day would exist. To me the more meaningful number is the 105,108 ratings and reviews. That's more than a hundred thousand people who have not only read my books, but felt strongly enough about them to express an opinion. Now THAT is pretty darn cool. Long, long ago, when we were releasing my very first book through a small publisher in Minnesota Robin and I were walking to the Metro for a night on the town to celebrate the contract signing. She was going to work on "getting the word out" while I concentrated on writing. She asked me, "How many people do I have to get to read your books for you to feel like a success." After some consideration, I replied, "Fifty." Then after a pause I added, "But they have to be people who I've never met and know nothing about me." She nodded and said with confidence, "I can do that." To be honest, I wasn't as convinced. I should have known better than to doubt her. Robin has never failed at anything she's set out to do. And I think she overshot the mark by a pretty large margin. So I want to thank Robin for all the hard work she's put in to get my books read, and most importantly to all those people who have taken a chance on a new unknown author. Your support of my books has been amazing, and I, and Robin, are eternally grateful. I was supposed to do a presentation tomorrow at Indie Recon 2015 regarding Hybrid Authorship. Turns out one of Robin's tests is occurring at the exact same time as that live session, so I've cancelled. At some point after everything is said and done, I'll try doing a "recorded" version of the presentation and make it available. Sorry for the short-notice cancellation. In any case there is a huge line-up of excellent presenters including: Portter Anderson, Belle Andre, Barbara Freethy, Joanna Penn, CJ Lyons, Mark Corker, David Farland, Jane Friedman, Victoria Strauss, Ben Galley, and many, many more. The on-line conference starts today, and the full list of events can be found here. Hectic doesn’t quite describe things lately. We have a saying around our house that March is bad luck, as it has been the time of the worst events (I don’t have to tell you, do I, Julius?). This year March is spilling into April. Contract negotiations, a car accident (not me), and a tight deadline to finish the First Empire series and a short story for an anthology, have kept me too busy to even properly finish last month's AMA in a timely manner. Now, most recently, my wife spent a night in the hospital suffering severe chest pains with tests revealing ‘cause for concern’. As a result if emails are not replied to, threads are left hanging, or I am otherwise missing from public discourse, it's because a wrench was jammed in a vital group of gears. I'm really busy editing the last book of the First Empire, so no time today for a "Authors Helping Authors" or "Author's Tools" post. (The take quite a bit of time to research, write, and review. I really want to get this book edited in time for Robin's birthday so I didn't do my usual "Wednesday Night out" and while I had ballgame tickets for yesterday, I left early so I could get some writing in. But, I did run across a poll on Goodreads that I thought was interesting so I thought I would pose it here and hopefully get some more people to weigh in. The question? 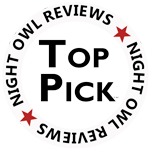 How many reviews do you usually look at before buying a book? More than 63,500 people have already answered the poll. You can answer for yourself here. 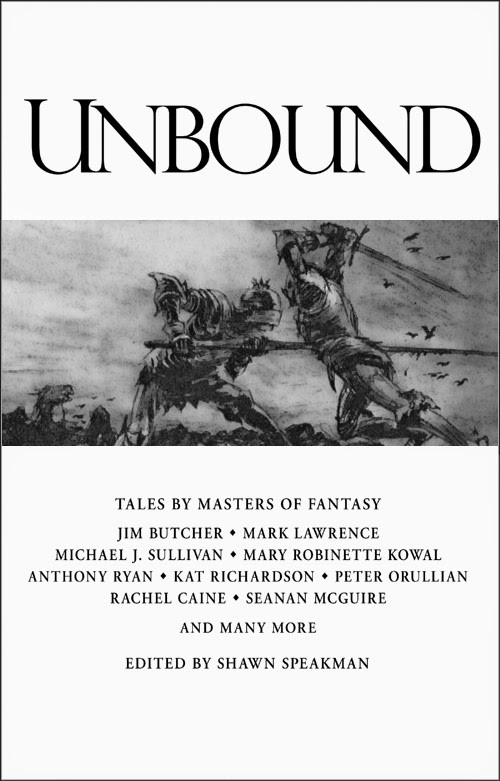 Yesterday I sent Shawn Speakman my final version of "The Game" a short story to be included in his Unbound anthology. I really like the way it turned out. I'm a bit embarrassed because it was a day late, (Shawn wanted the stories by then end of March). But as some here already know I've been working on finishing up the last book of the First Empire, and it's just really hard to shift gears that close to the end of a five book epic. The good news is I wrote this a few Christmas's ago and set it aside for Shawn as I thought it would be an excellent fit for either Unbound or his upcoming Unfettered II anthology. Robin, as always did my editing - and man she really out did herself with this one. As is always the case, we have heated debates over editing. There was one "concept" in particular that she found was just too hard to understand (or maybe I wasn't doing a good enough job explaining it). But the real genius came from reworking the end. She wasn't happy with my rather rambling 1,124 word ending and we decided the book could stand well without it. I had to agree with her and the new ending was much better. But still not perfect. A little more brainstorming and the light went on. Now in just 191 I got the ending that I thought was the perfect punctuation to this short. I can't wait until it's released and other can start enjoying it as well.